Part 1 is the beginning of the “A Cold Wind Blows” story and the title track for Debra’s Album. Part 2 of the continuing story . . .
Part 3 of the continuing story . . .
Part 4 of the continuing story . . .
Part 5 of the continuing story . 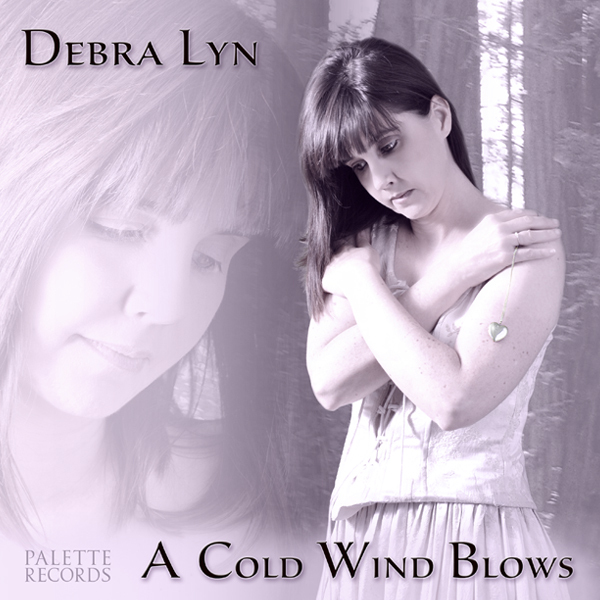 . .
On March 17, 2014 Debra Lyn released her second solo studio album A COLD WIND BLOWS. Over five years in the making, Debra Lyn’s A Cold Wind Blows is an invitation to experience the vast complexities and stark, simple truths that shape our most intimate relationships, define our deepest emotions, and ultimately determine who we are… and who we aren’t. It is a vivid snapshot of a marriage rocked by infidelity and addiction, and a gut-wrenching journey into the heart of “a good wife” besieged by pain, anger, helplessness, hate and loss. And yet, astonishingly, this tale is not a tragedy. Rather, it is a universal anthem of unwavering courage and uncommon strength — one where the battlefield isn’t joined by men and women, or husbands and wives. This war is utterly within, and ultimate victory or defeat boils down to one question: what does ‘till death do us part mean when the marriage dies, but the love goes on? The answer is meticulously and masterfully revealed through each track on the wings of a cold wind; sometimes in potent gusts, sometimes in gentle breezes, and always with unforgettable impact. Tim Lorsch (strings): Tim has performed and/or recorded with artists such as Kris Kristofferson, Kenny Chesney, Keith Urban, Lucinda Williams and Goose Creek Symphony. He has produced critically acclaimed records, played on thousands of recordings and has made contributions to Grammy and Emmy Award winning projects. Tim also co-wrote “With Or Without You” with Jeff and I. “A Cold Wind Blows” would not be complete without Tim’s emotional and poignant performances. Matthew Burgess (percussion/drums): Matthew has worked with artists such as Willie Nelson, Big & Rich, Gretchen Wilson, Steel Magnolia and Jewel. From a standard drum set to a djembe to a tiny triangle, he brings a sensibility and attention to detail that is uniquely Matthew. David Flint (acoustic guitars/bouzouki/resonator guitar). David has played with Highway 101, Billy Montana and is a sought after session musician. David’s meticulous parts are the bed upon which everything else has been layered and help to set the tone for the album. Scott Vestal (banjo): Scott was the 1996 International Bluegrass Music Association’s Banjo Player of the Year. He was also named 1998 Banjo Player of the Year by the “Bluegrass Now” magazine fan’s choice awards. Scott has performed with Doyle Lawson and Quicksilver, John Cowan, Tim O’Brien, Ricky Skaggs,Tony Rice, Tim O’Brien, Sam Bush and many others. Scott’s banjo performance creates a “Newgrass” feeling for the song “Believe” and truly compliments the rest of the album. Randy Kohrs (dobro/banjo): Randy recorded, produced and performed on the 2008 Grammy Winning CD, “The Bluegrass Diaries” by Jim Lauderdale. Randy is a sought after session musician and has played on over 500 CDs including projects by Dolly Parton, Tom T. Hall, Sara Evans, The Wreckers & Little Big Town. “I’ll Always Miss the Love I Left Behind” is a remix from Debra’s previous release on her “I Can’t Remember To Forget You” album. This new version is much more acoustic based and brings Randy’s dobro performance front and center where he can be truly be appreciated. Jeff Taylor (accordion): Jeff’s great performance on “Drunken Fool” creates the tongue and cheek barroom atmosphere for this song. Jeff plays regularly as a member of the Nashville based band, the Time Jumpers, which is a virtual who’s who of session musicians including artist, Vince Gill. He’s appeared many times on the Grand Ole Opry backing numerous artists. Jeff has recorded with Elvis Costello, Paul Simon, Amy Grant, George Strait, The Chieftains, Martina McBride, Vince Gill and Ricky Skaggs. He was a featured artist on the Ricky Skaggs and Kentucky Thunder “Instrumentals” CD that won a Grammy in 2007 for Best Bluegrass Album. Steve Stokes (fiddle): Steve has toured with Josh Turner, John Michael Montgomery, Blake Shelton and Trace Adkins. “So Long Since September” is the second remix from Debra’s “I Can’t Remember To Forget You’ album. This new version features Steve’s Celtic style fiddle performance matched by David Flint on acoustic guitar. This will leave you wanting to hear more! Tyler Reese (acoustic guitar). Tyler’s bluesy guitar playing is featured on Debra’s song “Till I’m Gone” and brings an interesting and new flavor / twist to a few other tracks on the album. Jeff Silverman / Palette (MSP) music • studio • productions: Jeff played bass, additional acoustic guitars and percussion. Jeff’s nearly 40 years of experience in the music industry has included working on Emmy and Grammy-nominated projects. He has also produced, mixed, mastered, co-written, edited and performed on a number of gold, platinum and award-winning projects for artists such as Rick Springfield and Michael Peterson. Jeff is co producer and co-writer of the recently released “From The Vault (A Collection of works by Rick Springfield & Jeff Silverman)”. He has also been a staff songwriter at Motown/LA and is the owner operator of Palette (MSP). The “A Cold Wind Blows” video was directed, photographed and edited by Jace Smith. Jace is an award-winning cinematographer who has worked with Guns ‘n Roses, Paula Abdul, Toto, Alice Cooper, Great White, to name just a few. to all of the musicians who gave so much of themselves and shared their talents. to Jenny for the wonderful photos. to Aeone for listening and being so supportive. to our friends (some of whom we haven’t yet officially met, but are very supportive on facebook and on-line), and to our family. The CD received a four star rating from Stacy. Debra Lyn’s second studio album, over five years in the making, is yet another collaboration between the singer and her husband, Jeff Silverman. Debra’s co-writer on 6 of these 11 songs (including With or Without You, with a theme of expected, impending loss that Lyn and Silverman co-wrote with the song’s co-producer and co-arranger, Tim Lorsch), Jeff also produced mixed and engineered these songs. Debra’s measured, eerily uncanny approach to her performance of the title song, introduces the recurring characters in these songs through the lens, and familiar country-music theme, of marital intimacy turned triangular in scope. One Heart underscores the no-holds-barred morality play theme of these songs, paying particular attention to the fallout from an adulterous relationship from the perspective of each of the parties it touches. Swim the River is a song of determination to preserve (what’s left of) a relationship, while Closer to Goodbye is the acceptance of what might be the inevitable “other side” of that same coin (i.e., an acceptance, if not an embracing, of the truth as reality sets in). Believe, “an introspective view on depression,” escapes a maudlin denouement, courtesy of the musical offer of a credible lifeline. I’ll Always Miss The Love I Left Behind (remix) is a wistful consideration of what might have been, while So Long Since September (also a remix) is a song of separation resolved (apparently) by a happy ending. The album’s finale, Till I’m Gone, paints a picture of a woman strong enough to leave a relationship to which only she appears committed, but not without the anguish of a woman still in love with a man unable to value her as she now must (learn to) value herself. These songs will resonate with those who appreciate Debra Lyn’s artistry and the sentiments of these lyrics, especially if they identify with the situations portrayed in these songs. The first song on the CD and the beginning of the story that sets the tone, introduces the reoccurring characters and leaves you wondering at the end, what really is going to happen. The video gives you a view of this story of a lovers’ triangle and leaves the story open to different layers of interpretation. Through all of the turmoil created by an unfaithful husband, she somehow finds her strength to continue on. No matter what the eventual resolution is to the triangle, everyone suffers. “One Heart” in the context of this continuing story, shows the internal struggle that the woman feels clearly seeing the relationship that she now has, but also remembering the relationship that once was. She is no stranger to the emotions of love, hate, confusion and disappointment that seem to plague her every moment. Even while she holds her husband’s memory in her heart with love and sadness, she continues to wrestle with her emotions. She feels that he is leaving even though “no words have been spoken,” yet she still holds the hope that for every heart that is bleeding, one is falling in love. The ongoing theme where she knows something’s on his mind. She doesn’t know what it is or what the future holds, but the one thing she is sure of is that she is determined and will give everything to keep him by her side. She’s committed and she’s strong and will do whatever she can to keep their relationship together. “Closer To Goodbye” brings you into the sadness of an impending break up. It is a struggle to reconcile in her mind a relationship that was “perfect” and now barely exists. Despite her desire to start over, she realizes that each day brings them one step closer to goodbye. The bridge states how much she REALLY wants to find a way to fix this, but even though (chorus) every night, she wants to have him near, it’s only in her dreams. Things keep getting worse, and worse and her hope keeps getting darker leaving her struggling with love, loss, commitment and heartbreak. How many times have you heard the saying, “Like Father, like son?” or “The apple doesn’t fall far from the tree?” Sometimes people fall into the lifestyle they know. In the case of “Believe,” he realizes that he is not good for her, but because of his past, his upbringing, he feels that he is not worthy of her and even though he wants to – he cannot change. In short, he’s waiting for the cure or someone who will save him from himself. It’s a very introspective view on depression. He may be alone sitting on the cliff or she may be there with him. There’s a few lines at the end of the song that says she’ll throw him a lifeline, but at the same time, she could use one herself. She has always had to be the strong one and knows that that she will survive and help him… believe. It could be in God, could be in her, the relationship again. Lots of, as you might say, layers to the interpretation if you want to look deeper. “With or Without You” is one of the final chapters in the story that finds him lying unconscious in a hospital bed without much hope of recovery. As she sits by his side, she realizes that despite everything – all the sorrow and pain, she knows that she really does not want to live without him and wonders if she even can. Did I ever give you enough? Did I ever tell what you mean to me? The barroom clears, leaving our “good wife” alone in the dark to contemplate her life, her marriage and her future. She sees no light at the end of a very long tunnel and her choice at that moment is to drown her own sorrows in a bottle of tequila. This song comes as the next day “hangover” reflective state of mind that she is in. At this point, she is exhausted of being continually beat up emotionally. While looking through an old class yearbook, she remembers an old love from high school. The grass is always greener when you’re looking back and wondering what might have been. Maybe she made the right choice or maybe she never should have let her first love go. Sometimes we glamorize the past too much and this song, even though more to the lyric than what I’m describing, feels like one of the many emotions that a failing marriage or someone that has a challenged love, might be going through or thinking. The fact remains – you can never go back. Although he has left her, she has never given up hoping that he would return. He finally realizes that he cannot find anyone in the world like her and decides to come home one rainy night. She finally gains the courage and strength to leave him and not look back. Before she goes, she leaves a parting note to tell him that one day he will realize what he had – and maybe one day he’ll want her to come home. Sitemap • Copyright © 2013-2019 Debra Lyn • All Rights Reserved.